Chioma Okereke’s debut novel is as intriguing as its title, Bitter Leaf. Okereke weaves a narrative that is full of musicality and complex characters as she takes you on a journey to experience the life and times of the people of Mannobe, the imaginary world she writes about. Okereke’s language is vivid, evocative and steeped in poetry, which adds a rich texture to the canvass of the picture she paints for her reader. In her own words, Chioma Okereke talks about her writing as a means of escapism and why language is a mechanism for doing, saying, experiencing and exploring. Belinda: When did you discover your love for literature? Chioma: I don’t really know where it came from; we weren’t terribly surrounded by books at home. But I always found the libraries at schools fascinating, just the sheer volume of tales they guarded. There was something about being swept away by a story and by words…Eventually their subtle magic took hold. Belinda: You are first a poet but when did you start writing prose? Chioma: It came about shortly after I refused to ever write prose. It was after an argument where I’d been fiercely defending poetry, and suddenly prose began to announce itself almost as a reaction. Belinda: Based on your biography, you have been writing for a long time but did you have a defining moment, when you knew you wanted to be a writer and will one day be a published writer? Chioma: The moment I recognised myself as a poet after university was when I was living in New York. One night we went to the Nuyorican Poets Cafe, and I saw these people on stage, delivering their poetry, and I thought: is that what I’ve been scribbling at these years? In terms of becoming a published writer, I would say my perseverance was more about refusing to accept the word no (so readily dispatched throughout the whole process) than ultimately being an author. Belinda: Let’s talk about your writing journey a little, how many stories or ideas did you work on and got a no from agents or publishers? Chioma: I gave Babylon (one of the characters in Bitter Leaf) a line about the word ‘no’. He elicits it so many times from Jericho that the word loses its meaning and almost becomes a prize in itself. It took years for me to receive a ‘yes’, so much so that when it finally came it was something of an anticlimax! I’m fortunate that Bitter Leaf is my first book, because I was determined for those characters to be heard. But it took an infinite number of drafts to refine their stories. Belinda: Are you a full time writer or do you keep a day job like other writers and write in your own time? Belinda: When did you get that breakthrough and how did you nab yourself an agent who believed in you? Chioma: In 2008, when I secured my agent. But it took many, many years of trying. Belinda: Who are your literary influences? Chioma: Everyone and no one. There are writers I greatly admire – Toni Morrison, Alice Walker, Sonia Sanchez, Gabriel Garcia Marquez, Isabel Allende, André Brink to name a few…but they’ve probably influenced my desire to write rather than my work itself. I’m equally influenced by music, film, and art as I am literature. Belinda: How would you describe your writing style and voice? Chioma: I think it varies with whatever I’m working on. For Bitter Leaf, it would be a tango. Belinda: There is the art of writing and the discipline of writing, you write for two very different genres, poetry and fiction. How do you negotiate these different worlds without giving one more power over the other and strike a balance? Chioma: I’m not sure that I did! But for this novel I don’t think it mattered. For me, it was important that an element of music could be stressed, and the poetry allowed that in a way that purely prose may not have. Belinda: What’s the inspiration behind Bitter Leaf? Chioma: Escape, pure and simple. Once I’d set myself the challenge of writing prose, I wanted to ‘get away’, and since I couldn’t do that in reality, I decided to create an imagined place that felt very real. Belinda: I am interested in the title of your novel, Bitter Leaf, it instantly conjures up a number of images/memories for people who know what Bitter Leaf is in Nigeria, why this title? Chioma: I’d envisaged another title for a very long time, but it was only when this one sprang upon me that many things slotted into place story-wise, and that others also seemed to latch onto it. As a Nigerian, it feels very familiar and comforting, but it is the duality of the title, read in literal context, that is more interesting to me. It evokes a kind of melancholy. Belinda: Mannobe is a world you created, why did you want to write about this imaginary world/village which I must say has its own personality? Chioma: The book was my escape. If I’d written about home or someplace real, it would have had less of that element to it. Belinda: Allow me to describe myself as a novice, who has no idea what the Bitter Leaf is about even though, I have read it. Hence, for the individual who is yet to read your novel and is learning about about it for the first time as they read this interview; if I ask you to tell us what your novel is about in a few sentences, what would you say? 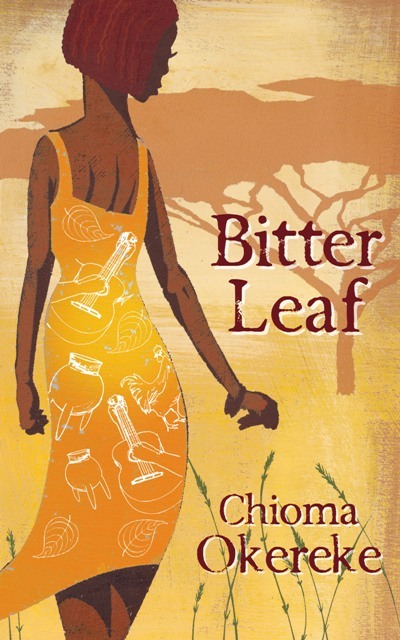 Chioma: Bitter Leaf is about the lives of six characters intertwined in a village on the threshold of development. They strive to navigate their present lives while aware of the encroaching future, all with varying levels of success. Belinda: How long did it take you to write the novel? Chioma: All in, probably about five years. Belinda: How many imaginary friends did it take for you to create the imaginary world/village you created though your characters are everyday people? Chioma: I wanted to create a place with a sense of history, of tradition and grace. To me, the characters were real, not based on people in my life, but they were flesh and bone nonetheless. Once the population announced itself, it was extraordinary how easily the place was shaped. Belinda: Mannobe as a community is African in nature but not specific in geography to any African nation. Was that a tactical writing skill in order to make the themes which come through in your novel universal? Chioma: Yes. I wanted people to read a story, not necessarily focus on where it was based or where the writer was from. The reader’s imagination would therefore be a key component in the novel. In many ways, I would have made the village less discernible on a globe if I could, but in the end I opted for an African lean. Belinda: What did your research involve though you were writing about this imaginary world? Chioma: African Characters are everyday day people living everyday life! Life was my research! Belinda: How did you come up with the colourful names like Allegory, Jericho, Driver, Guitar and Babylon? Chioma: The names came from the characters themselves. I know writers say nonsense like that all the time but in this case it’s true. Belinda: Are the names symbolic of anything or have any hidden meanings? Belinda: Let’s talk about two of your characters, Babylon and Jericho, there is that element of longing which they both have in their lives; Jericho longs for the city while Babylon longs for her. How easy or challenging was it to write these very individuals who are opposites of each other? Chioma: I don’t think they are opposites, in fact, I think it’s noticing their similarity in their other that makes them react a little adversely at times. In terms of their longing, we’re all yearning for something in life so it was relatively easy to identify that place, even though writing from it isn’t. Belinda: And there is the relationship between the powerful and powerless in society, was that something you wanted to question as it exists between the less privileged of the Mannobe community and the rich, Dorique family you also write about? Chioma: It came about organically as Jericho’s story unfolded, and was an inevitable issue as the locals faced the entrance of commercialisation. Belinda: You take a reasonable chunk of pages to lay the foundation of the story. It takes a few chapters into the story before one begins to get an idea of the picture you are painting and that could put a lazy reader off. Were you concerned that readers may not be patient to get into the story? Chioma: Some people think the story kicks off from the first chapter; others feel it takes a little while longer to get going. Personally, I’m with the first group. But similar to the ‘when does life begin argument’, it ultimately depends on the individual’s definition of a ‘story’, and I can’t change anyone’s mind on that, nor do I wish to. Belinda: Your language is also very poetic, vivid and evocative, which of course is a testament to the fact that you are a poet but what is it about language and its function within a story/novel that excites you as a writer? Belinda: In addition, there are elements of exoticism, mysticism in your novel, which comes through in the language but ‘food’ plays a big role the plot through the Codon sisters who own/run a café/restaurant, did you use food in the novel as a symbolic way of bringing people together or were you unaware of the fact that it was creating a personality for itself? Chioma: I was blissfully unaware. In addition to wanting to escape, I must also have wanted to be fed! Belinda: What has the response to your novel been like since it was released in June? Chioma: As the author I wouldn’t know. People are hardly going to tell you they hate it to your face are they? Belinda: Why do you think people have been able to relate to the story/book the way they have? Chioma: It’s a universal story that resonates with human spirit. Belinda: What do you want people to take away with them after reading your novel? 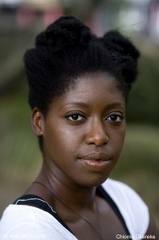 About Author: Chioma Okereke was born in Nigeria in 1976. She started her writing career as a poet and performed throughout Europe and the United States before turning her hand to fiction. Her work has been shortlisted in the Undiscovered Authors Competition 2006, run by Bookforce UK, and in the Daily Telegraph’s ‘Write a Novel in a Year’ Competition in 2007. This entry was posted on Monday, September 13th, 2010 at 2:02 pm	and is filed under Africa, Book Reviews, Interviews, Journalism, Nigeria, People. You can follow any responses to this entry through the RSS 2.0 feed. You can leave a response, or trackback from your own site. This is great, Chioma was my ‘senior’ at school and I remember she was always reading! (Though she may not remember). Great to see this accomplishment! I am always on the lookout for talented Nigerians, so do let me know about the new blood. I’ll certainly be looking for this book. Her reading has made me very curious. Congrats to Chioma.